Spring. It’s probably my favourite season, and this year it’s even more welcome than usual, after that looooong, bitter winter. 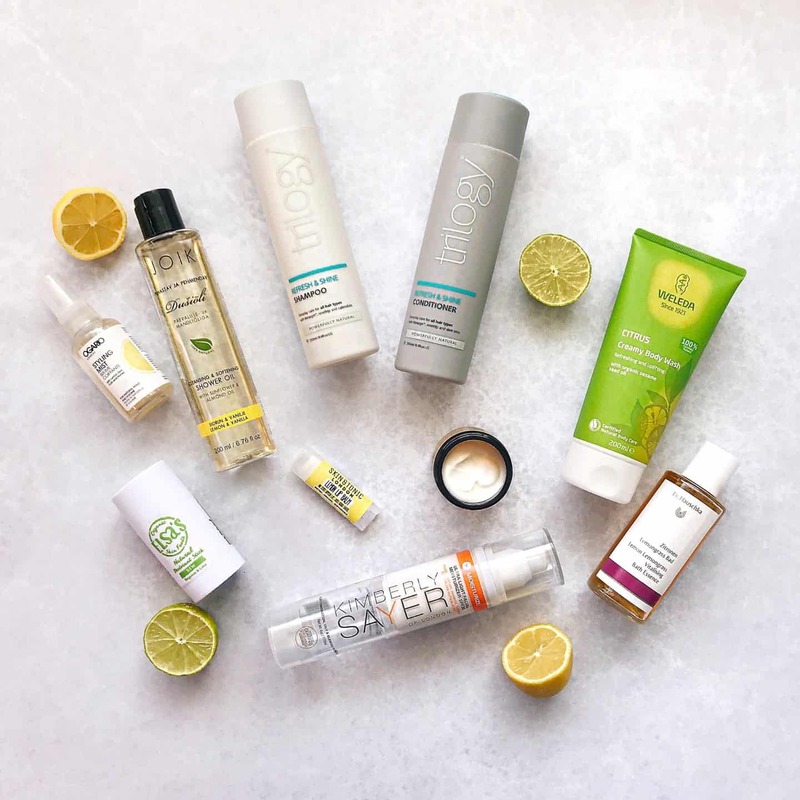 I’m finding myself gravitating towards lemon and lime skincare, body care and hair care, so this is my citrus zing for spring natural beauty edit. Lemon is such a fresh, uplifting scent, it’s perfect any time of the year really, but just seems to go extra well with spring. A few of them have lime in too which is also a gorgeous fragrance in my opinion. 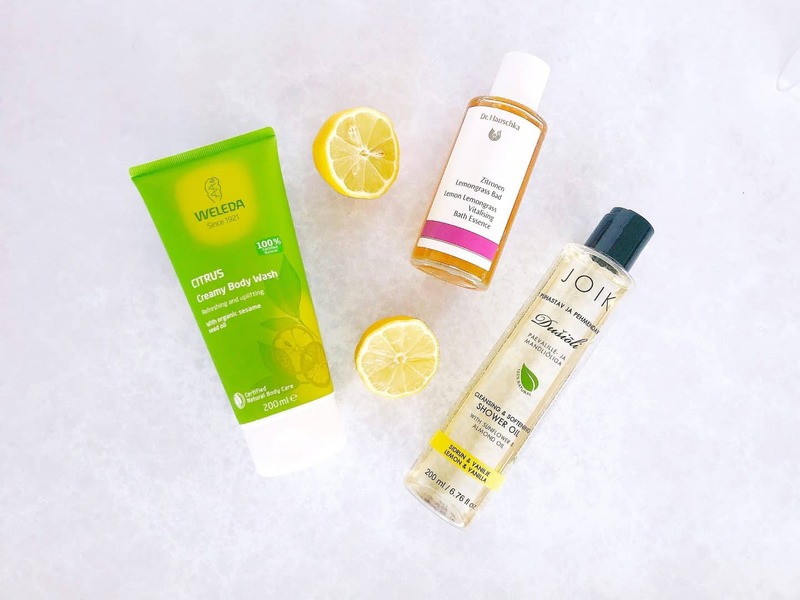 Each of these citrus delights smells ah-ma-zing and is sure to put a spring in your step, and the lemon scent comes from actual lemons, thanks to the natural brands I have chosen. I’ll start with this luscious lemon lip balm, which will give your lips a citrus zing for spring. This all-natural, organic lemon lip balm by Skin & Tonic is £3.50* and contains only four ingredients: shea butter, beeswax, coconut oil and lemon peel oil. It smells lush and makes your lips feel equally gorgeous. I’m also impressed by Skin & Tonic’s ethical and eco credentials. They only ever use seven or fewer ingredients, which are all natural and certified organic. Their mantra is ‘People, Planet and THEN Profit’ so they support small British and French producers and farmers, they source from Fair Trade women’s co-operatives in Ghana and Sri Lanka. They are 100% cruelty free and plant trees in the Suffolk countryside to help offset their carbon footprint. Skin & Tonic even donate 10% of their profits to Charity: Water, who are on a mission to change the fact that 1 in 10 people lack access to clean water. I’m keen to try some more of their clean beauty products based on how lovely this lip balm is. 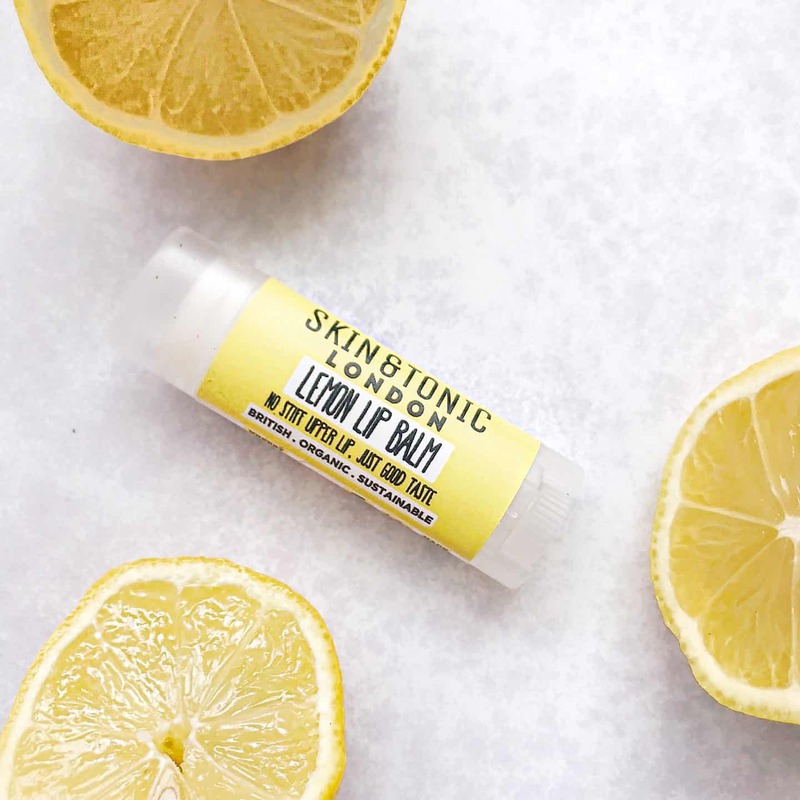 You can buy Skin & Tonic Lemon Lip Balm for £3.50*. 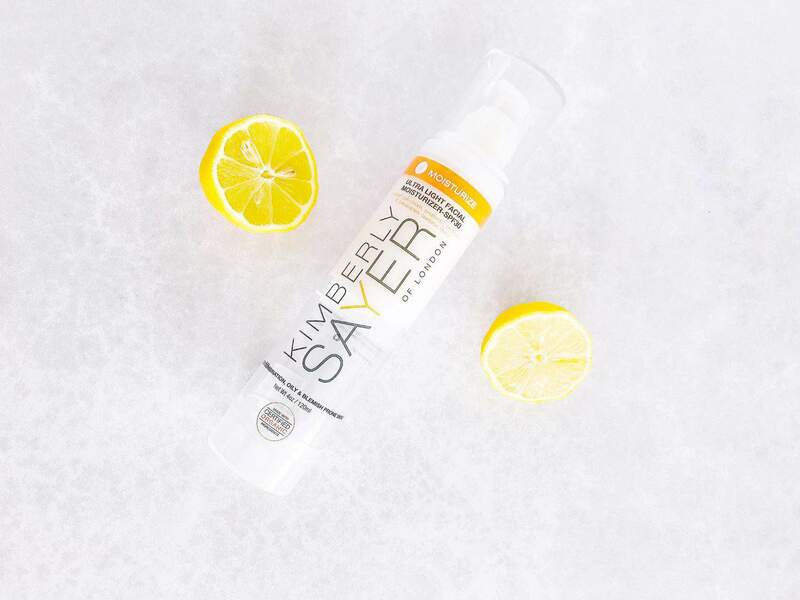 Next is a fabulously lemon-y face cream from Kimberly Sayer, which will wake up a dull or oily complexion, with a citrus zing for spring. Kimberly Sayer Ultra Light Facial Moisturiser is my absolute favourite face cream, and I’ve been using it for years now. Ava says it smells of lemon cake, which is true. It has an SPF of 30, so it’s perfect for everyday sun protection. You can read all about why I love Kimberly Sayer Ultra Light Facial Moisturiser on my in-depth review here. If you have oily or combination skin, I highly recommend it, as it’s so light and non-greasy. It is £26.50, but it lasts at least six months, so for me that is good value for a high quality natural product. You can buy Kimberly Sayer Ultra Light Facial Moisturiser for £26.50*. Next in my citrusy collection is Bia Beauty Lemon Myrtle Hand Cream, which also smells delightful. It’s very rich and soothing, and contains shea butter, beeswax, calendula infused oil and sweet almond oil. The lemon myrtle essential oil in this cream is also antibacterial. This zingy hand cream sinks in beautifully and I would recommend you use it overnight to wake up with super-soft hands. 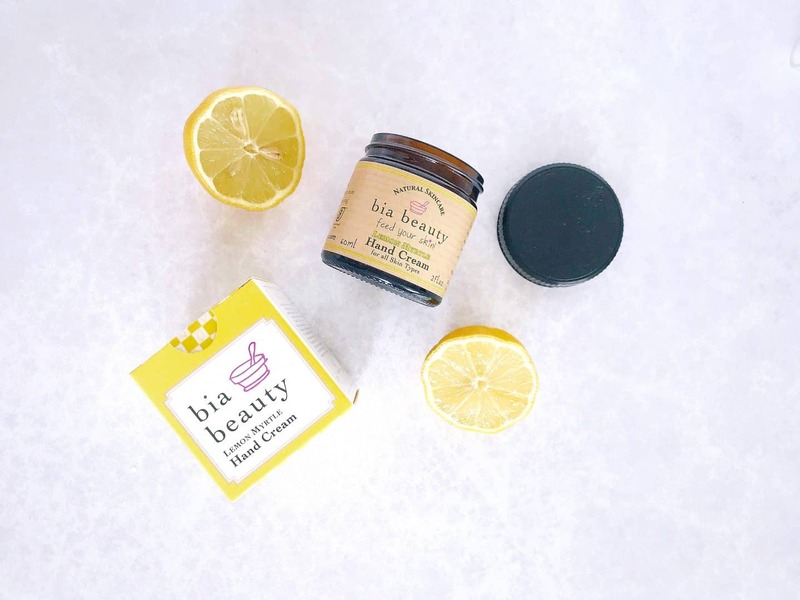 You can buy Bia Beauty Lemon Myrtle Hand Cream for £10.98*. A citrus-scented shower is a sure fire way to wake you up, and these zingy shower and bath products all smell gorgeous. On the left you see Weleda Citrus Creamy Body Wash, which is infused with both lemon and orange scents. It’s nice and creamy, and washes skin well. I don’t need to use a body lotion after I use it, but dry skin types may. At £7.95, I think it’s great value. In the middle is Dr. Hauschka Lemon Lemongrass Vitalising Bath Essence, which smells divine. It’s quite a refreshing bath oil, so I’d say it’s more suitable for mornings, or after exercise, than to relax you at the end of the day. Even though it’s an oil-based bath essence, it’s not overly greasy, so I didn’t find a ring in the bath! To the right is JOIK Cleansing and Softening Lemon and Vanilla Shower Oil. It’s a luxurious oil which gently foams when mixed with water. With ingredients including sunflower oil, sweet almond oil, it leaves skin so soft, and is 100% natural. Because it contains lemon oil, I find it does sting more delicate areas, so tend to just use it on other areas! You can buy Weleda Citrus Creamy Body Wash for £7.95*. You can buy Dr. Hauschka Lemon Lemongrass Vitalising Bath Essence for £17*. You can buy JOIK Cleansing and Softening Lemon and Vanilla Shower Oil for £15.90*. 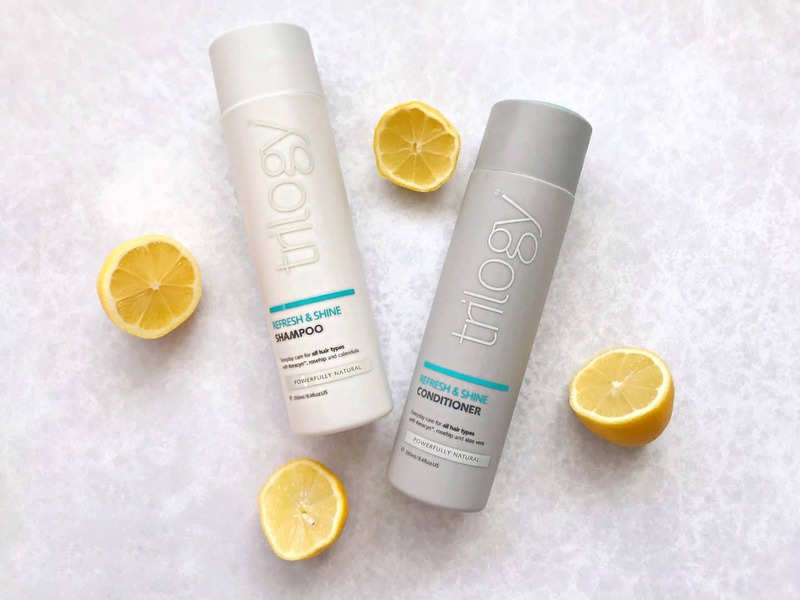 My latest shampoo and conditioner discovery is Trilogy Refresh & Shine Shampoo and Conditioner, and I’ve reviewed them in detail here. They make my hair so shiny and give a much needed boost of volume too. They have more of a subtle lemon fragrance and I’ll be re-buying these when they run out. After washing and conditioning my hair, I add a spritz of Ogario London Styling Mist, which contains essential oils and plant extracts. As well as lemon zest, it contains oat extract, keratin and argan oil. It gives a gentle lift and added shine to my fine hair, and smells lovely. You can buy Trilogy Refresh & Shine Shampoo for £12.50*. 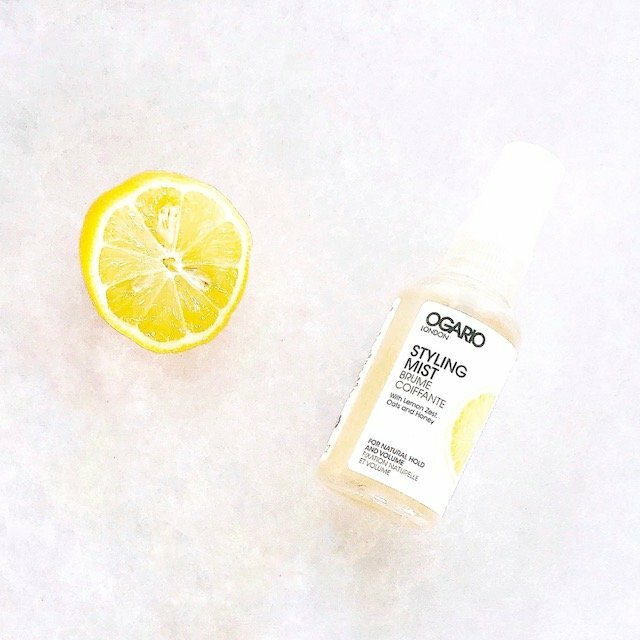 You can buy Ogario London Styling Mist for Natural Hold and Volume for £16*. This 100% natural deodorant by Elsa’s Organic Skin Foods is fragranced with bergamot and lime and is so zingy. It’s hands-down my favourite natural deodorant as it works so well, even in gym sessions. 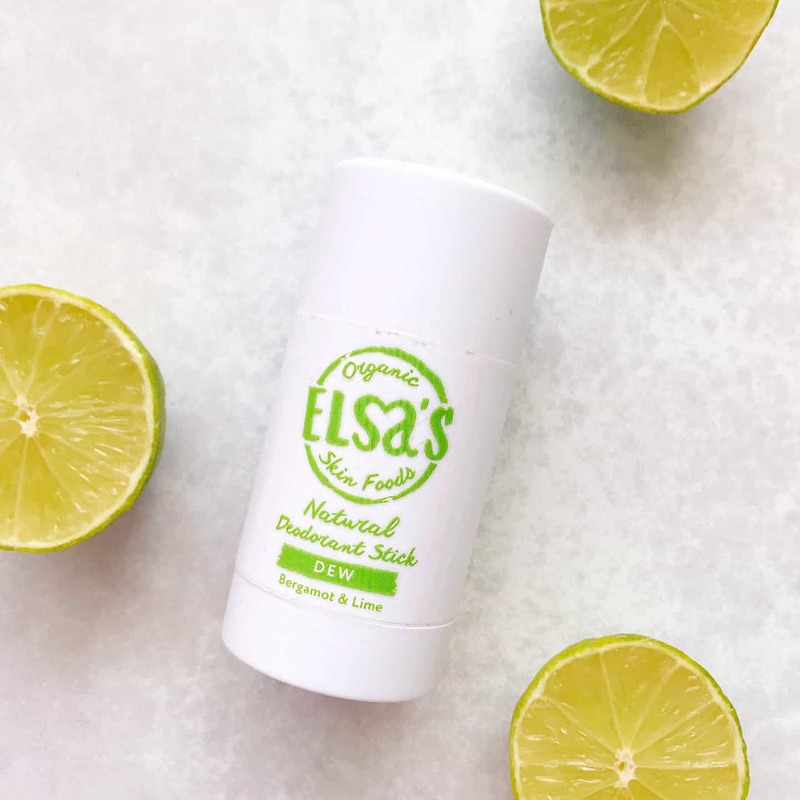 You can read my full review of Elsa’s Organic Skin Foods Natural Deodorant Sticks here. They are available in two other fragrances, and unscented, but Dew is easily my favourite. You can buy Elsa’s Organic Skin Foods Natural Deodorant for £10 each*. 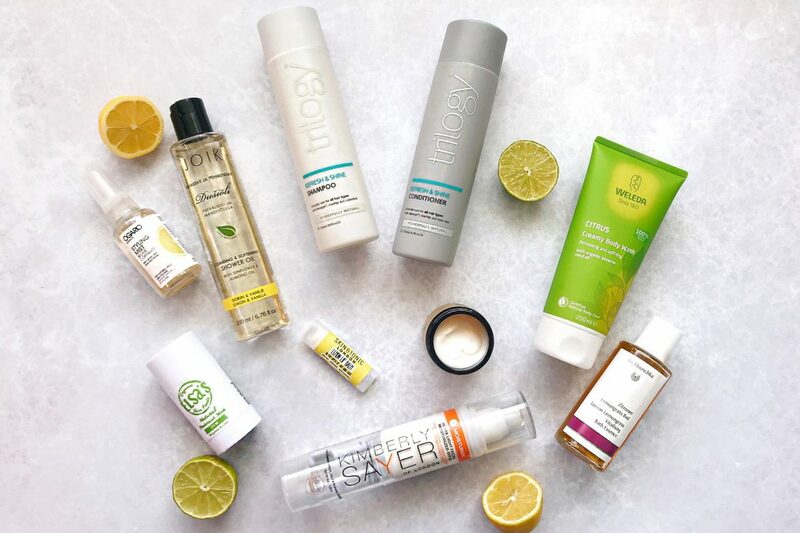 I hope you’ve enjoyed reading about my must-have natural citrus zing beauty products, why not Pin them for later? I love Dew deodorant from Elsa’s Organic Skinfoods! Nice picks! I love the Skin & Tonic Lemon Lip Balm, all Kimberly Sayer and Elsas!